Mix all the ingredients together in a bowl, add chicken and fold into the mixture. Cover and set aside to marinate for an hour. 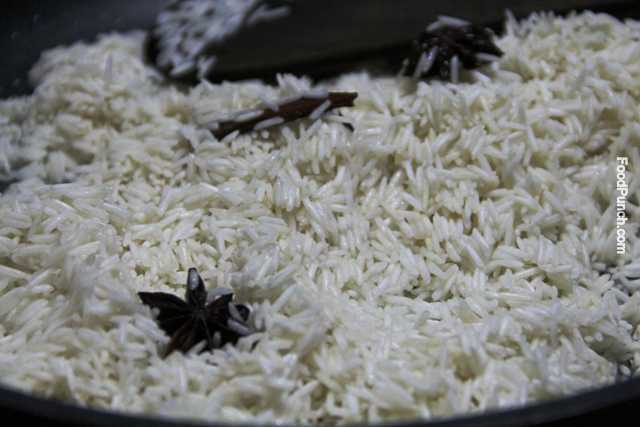 Wash the basmati rice, strain form water and keep aside. 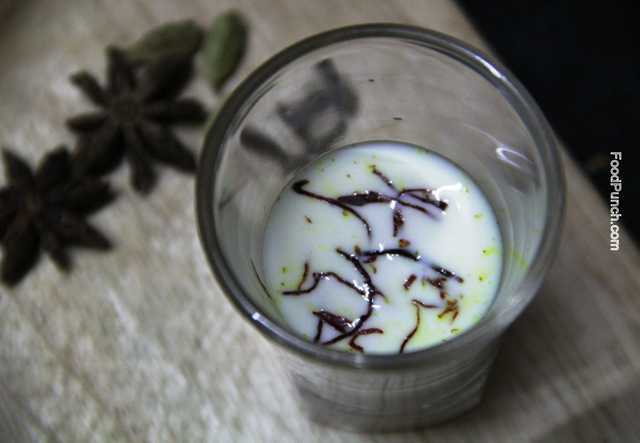 Also soak saffron in milk and keep aside. 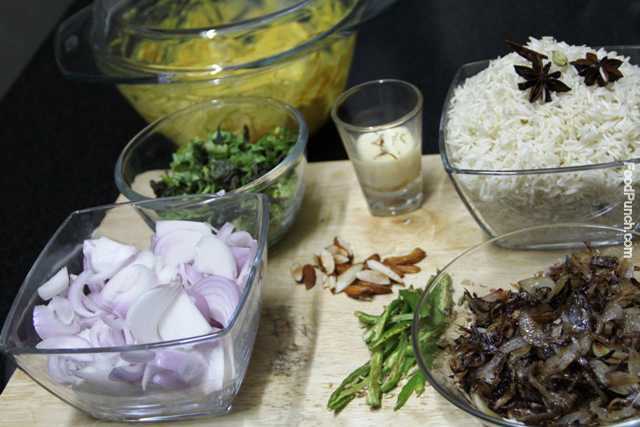 Divide the onions into two parts, heat a tablespoon of ghee in frying pan and fry one part onions till they turn to absolutely crisp and brown. Strain and keep aside. 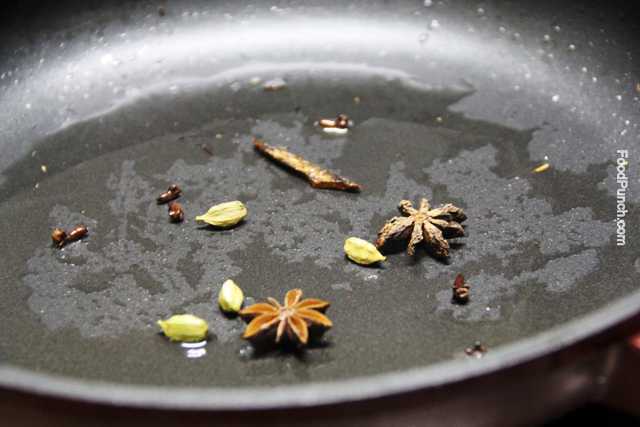 In the same pan heat two tablespoon of ghee, add the whole spices, star anise, cardamom, cloves and cinnamon stick. Fry for only 30 sec and add the soaked rice. Fry rice till every strand separates, stirring very gently, this should take about 3-4 minutes on high flame. Strain and keep aside. In the same frying pan roast the diced dry fruit, strain and keep side. In deep skillet heat tablespoon ghee, add the remaining onions and diced green chilies. Fry for 2-3 minutes till the onions turn light pink , then add the entire marinated chicken along with the marinade, stir well and cover cook till the chicken is only half done, stirring occasional in between, this would take about 7-8 minutes . Strain chicken pieces and the stock separately and keep both aside. 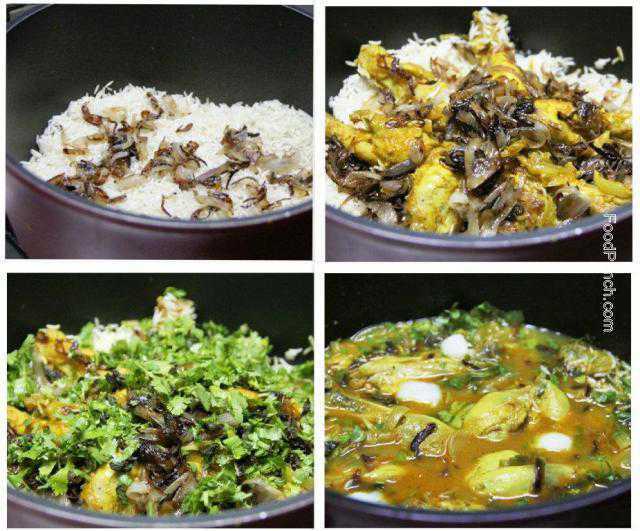 Now take the biryani cooking pot , I use a die cast deep casserole (a pressure cooker is also good, just the cooking time & amount of water should to be adjusted accordingly), first make a layer of the entire rice at the base, then 2/3rd of the fried onions, followed by the layer of the chicken pieces. 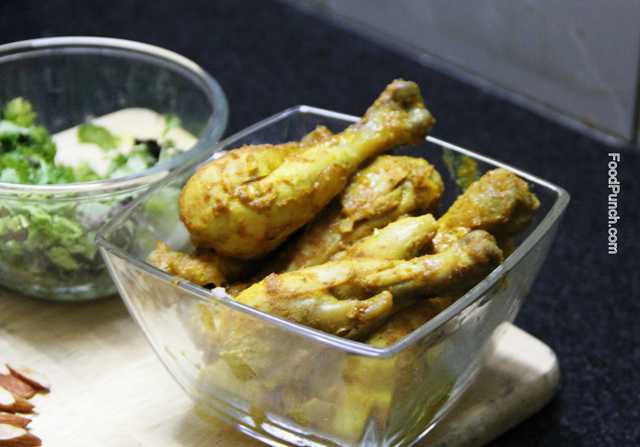 Now measure the chicken stock add enough water to make the entire liquid equal to 4 cups, to this add 2 teaspoon salt (or as per your taste), ½ teaspoon garam masala powder and pour it over the chicken. Now top it up with half of the remaining fried onions, keeping rest aside for garnish. Also add half of the chopped mint and coriander followed by a tablespoon of ghee. Cover the pot and cook on high heat for 5 minutes, then simmer and cook for another 10 -15 minutes till the rice is cooked. In the meanwhile, boil two eggs and cut each into a half and keep aside. Open the pot lid and check if the rice is done and the water has completely dried up. 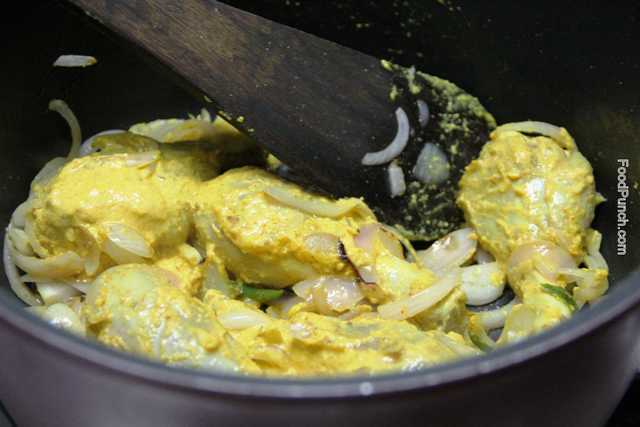 Now pour the saffron soaked milk all over and gently stir along the sides of the pot, add the remaining chopped coriander and mint cover and cook for 2 minutes on low flame. Turn off the flame and allow the aroma to build up for about 5 minutes and then add the entire lemon juice. Do add cashew and raisins as garnish if you like. Some people add permitted food color, while I find that absolutely unnecessary. Do add more mint if you like a stronger flavor of the same. 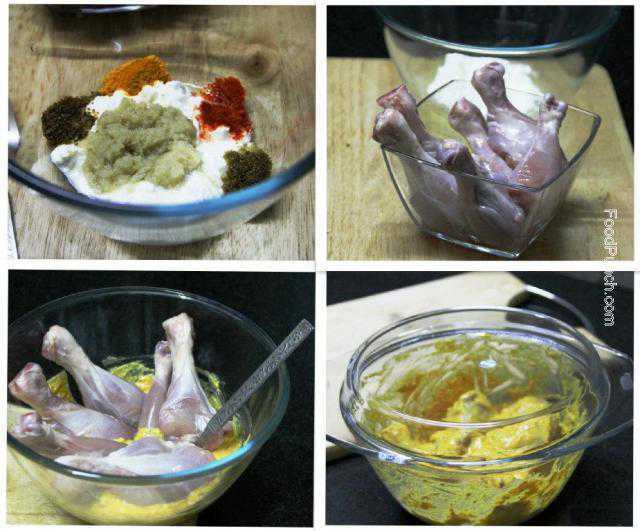 Do use one full chicken, infact that is what is used. I’ve used leg pieces only because I could not find a small whole chicken today and I was cooking for only three. Do not completely cook the chicken beforehand. Don’t be conscious about all that amount of ghee, it’s an integral part of the recipe. I would rather burn it out at the gym than to compromise on the flavor. Hey thanks Pranali 🙂 .. Did you try it ?? 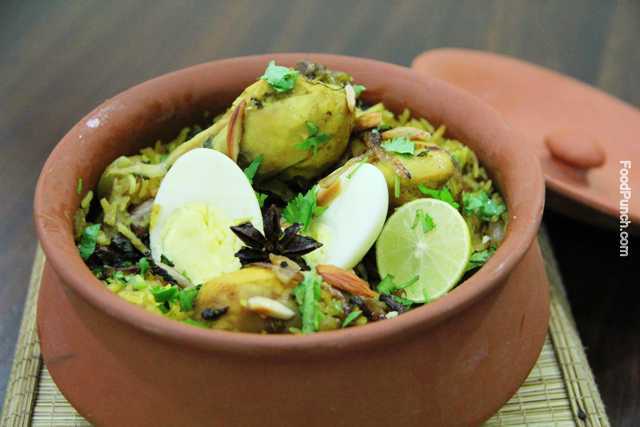 I followed the recipe with a few minor tweaks and the Biryani came out absolutely delicious ….Thanks for such a great recipe 🙂 Have tried the bread Rolls recipe from your site as well…Love your site esp all the drool worthy pics …. I am so glad my recipe worked for ya.. 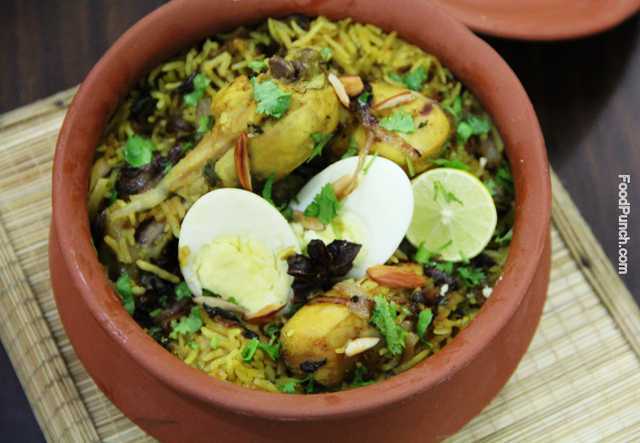 This chicken biryani recipe is our family favorite too.. Thanks lot for taking time and sharing your comment, that’s such a motivation.. Would love to have you try our other recipes too and let us know what do you think ..